This story was last updated at 1:13 p.m. on Monday, Dec. 11, 2017. 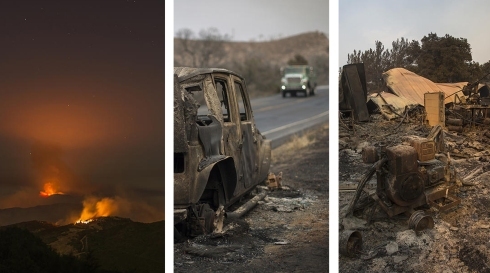 The hot, dry and sometimes windy months of summer bring the threat of large wildfires in California, where hillsides were left with crops of grass that turns into fuel for the fires. 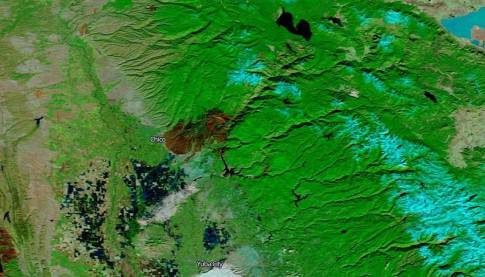 CAL FIRE reported four active large wildfires -- 300 acres or more -- burning across California as of early December. The worst wildfires have been in Northern California, where the death toll from several fires that tore through communities stands at 41. More than 5,700 structures have been destroyed. Through Dec. 3, more than 6,762 fires burned 505,391 acres this year. During that same period last year, 4,742 fires burned 244,297 acres. The five-year statewide average for that period is 4,749 acres and 202,696 acres. The state is coming off one of its wettest winters in years, which left hillsides covered in grass and other vegetation. That grass dried out during summer and turned into tinder, providing fuel for rapidly spreading fires often pushed by strong winds. An increase in the number of dead and dying trees also can exacerbate the wildfire threat, Cal Fire officials said. An estimated 102 million trees have died in California due to the state's five-year dry spell and bark beetle infestation.